Rivendell Theatre Ensemble is partnering with Theater of War Productions, Goodman Theatre, and The National Veterans Art Museum to present two FREE, public presentations of Theater of War. January 18, 2012, 7:00 p.m.
January 25, 2012, 7:00 p.m.
Theater of War is an innovative public health project that presents readings of ancient Greek plays, Sophocles’ Ajax and Philoctetes, as a catalyst for town hall discussions about the challenges faced by service members, veterans, their families, caregivers and communities. The readings from the plays are followed by comments from a panel that features a diverse group of military community members, as well as a town-hall style audience discussion. Each performance is approximately 2 hours long. 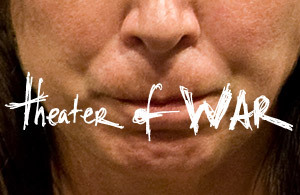 For more information about Theater of War, visit: www.outsidethewirellc.com and www.Facebook.com/TheaterofWar. Contact us at: info@outsidethewirellc.com. Made possible by the generous support of the Stavros Niarchos Foundation in collaboration with the USO.